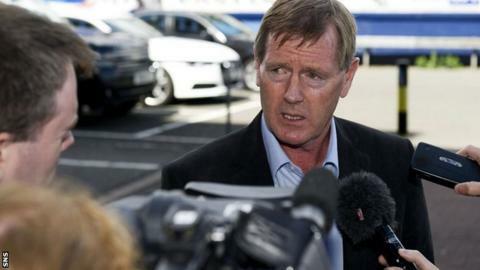 Dave King has urged Rangers fans not to buy season tickets and has accused the board of an "extreme act of bad faith". The former Ibrox director is upset the club have asked fans to renew their season tickets before the completion of a review of the business's operations. King will set up a bank account for fans to pay their renewal money into and act as custodian alongside former Rangers captain Richard Gough. Rangers described King's comments as "nothing short of disgraceful". King's intervention signals an end to his attempts to work with the directors in a bid to address the club's financial problems. He met the board last month and agreed to grant them time to complete chief executive Graham Wallace's business review and draw up a funding plan. The board pledged to release the details of Wallace's review, which he said at last December's annual general meeting would take 120 days, before fans are asked to renew their season tickets. The deadline for that period is 17 April. "The chairman [David Somers] has advised me that the board will now only issue the review at the end of the season-ticket renewal period and it will consequently not be timeously made available to fans," King said. "Disturbingly, the chairman has advised me that the true intention of the board had always been to delay issuing the review until funds had been largely collected. "I apologise to all fans for wasting time by lending credibility to the board's false representations. I was wrong to give them the benefit of the doubt. At least we now can no longer have any uncertainty about governance at the club. "It is common cause that the club is not a going concern without access to the season-ticket loan from the fans. It is also common cause that the season-ticket money will only provide partial relief in advance of a more permanent recapitalisation. "I believe that it is vital that fans now withhold season-ticket money from this board and similarly refuse to support the club by way of the purchase of replica kit or any other retail product." Rangers borrowed £1.5m from two shareholders to meet costs and that money will be repaid though season-ticket income. Wallace pledged to cut costs, but season-ticket money is critical. In March's interim results, going concern status was granted on condition of increased prices and sales. As a consequence, the board need to ring-fence any season-ticket income that arrives until they are certain the business is a going concern for the next 12 months. The Union of Fans - a coalition of supporters groups - pledged to set up a season-ticket trust fund for fans to pay their money into. The intention was to then provide the funds to the club in return for security over the property assets, which directors have insisted they will not borrow against. The account that is to be set up - with King, Gough and other custodians voted for by fans - will essentially provide the basis for the trust fund. "As a minimum, the board must provide the club property as security against the season-ticket money," added King. "I recognise that fans will have anxiety about 'betraying' the club and the risk of loss of a cherished seat at Ibrox. "However, the time has come when the trade-off is a potential loss of a seat against the loss of the club. That would be the real betrayal. "This board has lost its right to be dealt with on a good-faith basis." Rangers, who have referred the matter to legal advisors, noted King's statement "with astonishment" and said he had made "a number of untrue allegations". "The board stated that it will issue the results of the business review prior to the season-ticket renewal window ending," read a statement on the Rangers website. "This position remains unchanged and Mr King is well aware of this having sought personal confirmation on this matter from the chairman as recently as [Thursday]. "The business review period has not yet even ended, as Mr King is well aware, however he has elected to make yet another public statement to serve his own purposes. "When the board met Mr King a few weeks ago, he made it clear that he did not want to put another penny into the club and would prefer to see the club using other investors' money."